A MIXED martial artist from Inishowen will be competing for an amateur bantamweight title in Belfast next month. Ryan Murphy will be taking on Belfast man Glenn McVeigh (Fight Academy Ireland) in a bid to take Cage Conflict’s first ever amateur title belt in The Devenish Grand Ballroom on Saturday, March 9. 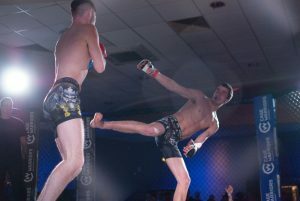 The 22-year-old just competed last Sunday night, February 3, suffering a title fight loss to Carl McNally (9-3-0) by second round submission due to a guillotine choke at the Cage Warriors Academy Ireland Fight Night in The Devenish. Speaking to the Inishowen Independent on Monday, a positive Ryan said the loss was an experience that he will learn from. 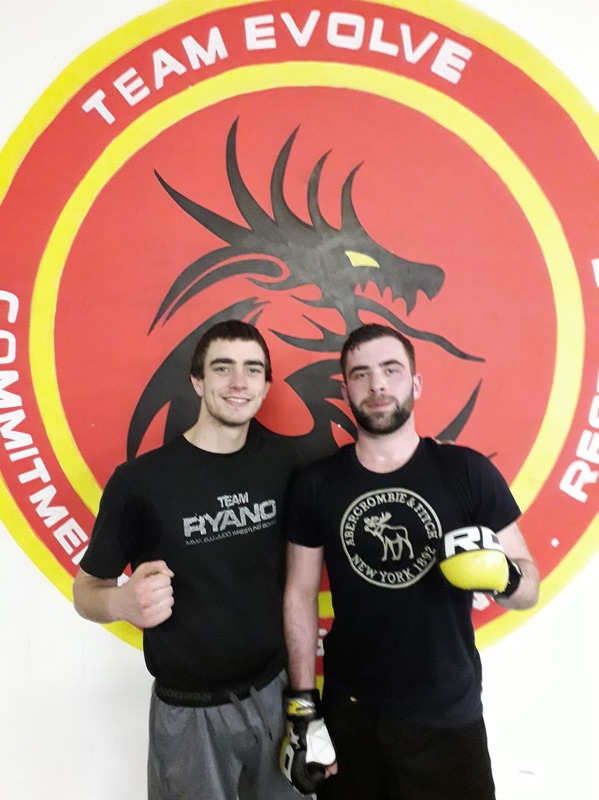 Training with Derry-based martial arts club Team Evolve under coaches Jason McCabe and John Rosborough, he is rearing to get back into training. “I’m not too worried about the loss last night, I was winning the fight and lost due to my own slip up. I got caught, but I’ll just have to deal with that and learn from it. “I’m not to sure if I’ll take a break today, boredom might kick in and I’ll feel guilty if I don’t go to BJJ (Brazilian Jiu Jitsu) training tonight,” he laughed. Ryan said he is not too familiar with his next opponent, Glenn McVeigh, but noted that the fighter has already been quite vocal online. “He’s taken it pretty far, to be honest. But I try to stay away from that as it can back-fire on you come fight night,” he said. Now training for over four years, with a record of 4-3-0, the son of Marian Began Murphy said he is content with continuing his amateur journey for the time being. Representing Inishowen – Team Evolve’s Ryan Murphy from Muff and Dean McGeoghan from Moville. Meanwhile, Ryan’s fellow Inishowen native and Evolve teammate Dean McGeoghan (22) from Moville makes his amateur debut at featherweight against Hugo Daniel Strutt (Fight Academy Ireland) on the same fight card next month. No stranger to competition, Dean already has ten bouts under his belt as a novice and now looks forward to the next step in his MMA journey. “I took up MMA about two-and-a-half years ago while I was in Boston. I always had an interest in boxing from a young age and did have ambition to start MMA. “Ryan was already training at Team Evolve and encouraged me to start training in Boston. 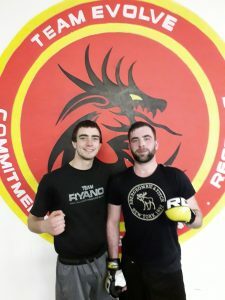 So I did about five weeks of Muay Thai and Brazilian Jiu Jitsu (BJJ) before moving back home to Donegal and joining Team Evolve,” he said. Dean grew up playing soccer locally, but once he found MMA, the team sport very much took a back seat for his new passion. Dean isn’t the first Moville man to take the step into MMA. His good friend, Irish featherweight Darragh Kelly, who trains with Rilion Gracie Ireland in Letterkenny, has already won six fights at amateur level. “Darragh and I are good friends and have actually trained together. He is very supportive and has offered me a lot of help,” he said. Besides working in the Redcastle Hotel, Dean said there is not much time for social activities as he very much dedicates himself to his training. “I definitely have ambitions to go professional. My aim over the next three years is to fight for Ireland as an amateur or turn pro. I plan to move to Canada for a year soon, but will definitely keep up the training while I am away,” he said. One of seven children (five boys and two girls) Dean is the son of Martin and Sheila McGeoghan. His twin, Derek, is currently living in London, but Dean is determined to also get him into MMA. Both fighters enjoy the great family atmosphere at their Derry-based club, with whom they also go on an annual team bonding and training trip to Portugal with. Ryan Murphy and Dean McGeoghan fight at Cage Conflict in the Devenish Grand Ballroom, Belfast on Saturday, March 9.